Tyler Denny will get the chance to make his mark at national level with a shot at the English crown, which has been relinquished by Elliott Matthews. 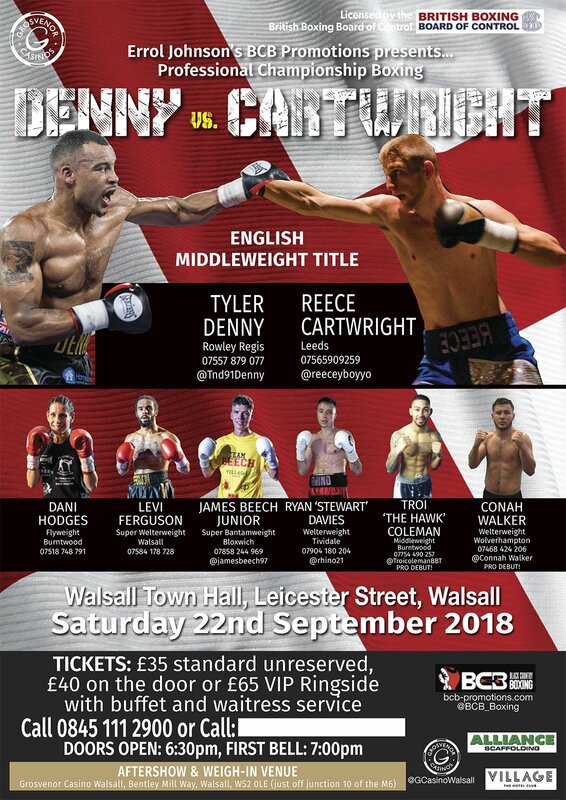 The 10-round contest, mandated by the British Boxing Board of Control, will headline Errol Johnson’s Black Country Boxing Promotions show on Saturday, 22nd September at Walsall Town Hall. Rowley Regis’ Welborn makes his first defence against Brummie former champion Tommy Langford on September 8, with the winner then ordered to take on Mark Heffron. Denny said: “Just to be in the mix is good for me and there’s no getting away from it, this is the biggest fight of my career. “I’ll be working with Ricky Summers (British title challenger) and Zach Parker (undefeated 16-0 prospect, who are both with BCB. “We’ve asked for Benjamin Whittaker (Team GB podium fighter) to come down to the gym so, hopefully, he’ll be available as well. An exciting eight-rounder culminated with Hunt seeing off a bloodied Davies by two rounds on points, 78-76, with the British Challenge welterweight crown on the line.